The defender has grown into a central figure for Martin O’Neill and is set to play a key role again tonight. Clark at yesterday's press conference. AS HE SAT cold-faced beside his manager, it was almost as if Ciaran Clark couldn’t quite believe the situation he found himself in. The Aston Villa hasn’t so much been thrown in at the deep end but after only a couple of appearances during this qualifying campaign, he has been forced to come of age. It was perhaps fitting, and revealing, that, in John O’Shea’s absence, it was Clark tasked with addressing the media at the pre-game press conference. It was the second time in a week he had been put in-front of the cameras – an indication of his growing stature within this Irish squad. “It’s not a position I expected to be in,” he said. “It comes from working hard and trying to get games at club level. Only then if you’re doing okay, the boss and staff will be watching. Although O’Shea returned to training at FAI HQ on Sunday morning, all indications would suggest O’Neill will stick with the same combination which served him well in Zenica. Richard Keogh may have been named man-of-the-match in the first-leg but Clark played an equally significant role in nullifying the potent threat of Dzeko and Pjanic, albeit until the 85th minute. “Everyone did well on the night,” he continued. “It’s hard for me to say whether it was my best game or not. We just all went out to do a job on the night to get the best possible result and we were quite happy at the end, although we were quite disappointed to concede late on. The 26-year-old has been in-or-around the set-up for a number of years now but has failed to establish himself, largely due to form and fitness. Having developed into a natural leader at Aston Villa, Clark’s qualities shone through the fog in Zenica on Friday night. The job is only half done, however, and Clark and his team-mates will need to replicate that performance again tonight. “Obviously it would be a massive honour for myself and all the lads to get to France but there’s still a job to be done here and it will be a tough task,” he added. Email “Ciaran Clark's coming of age an embodiment of Ireland's never-say-die campaign ”. 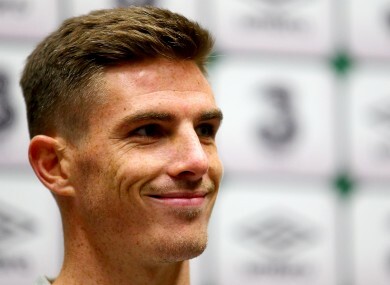 Feedback on “Ciaran Clark's coming of age an embodiment of Ireland's never-say-die campaign ”.